Build-A-Bear Workshop Recalls Colorful Hearts Teddy Bears : Shots - Health News Build-A-Bear Workshop has recalled three products in the past year. The most recent one? 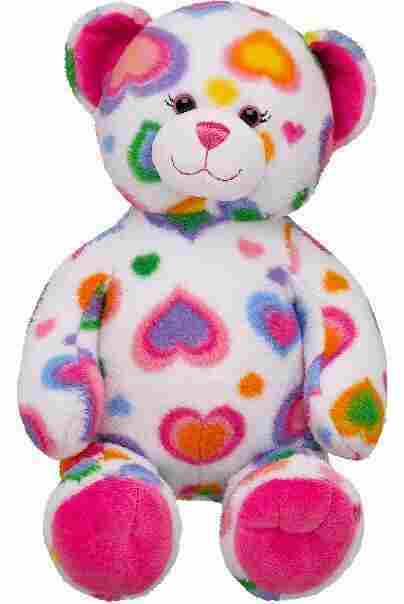 The Colorful Hearts teddy bear eyes could come loose and pose a choking hazard for children. If you gave or received a Build-A-Bear this holiday season, you may want to check it over. Nearly 300,000 Colorful Hearts teddy bears from Build-A-Bear Workshop sold in the U.S. and Canada have been recalled. The teddy bear's eyes can fall out and become a choking hazard for children, according to the U.S. Consumer Product Safety Commission. Company spokeswoman Jill Saunders tells Shots in a statement that Build-A-Bear hasn't received any reports of injuries or deaths from the teddy bears. A quick check of the company's website shows that three other Build-A-Bear products — an inner tube, a lapel pin and a beach chair — have been recalled because of potential safety problems. "That we have conducted three product recalls this year despite the fact that we have not received a single injury report related to any of those three products clearly demonstrates how seriously we take product safety," Saunders says. Before hitting stores, the Colorful Hearts bear passed an independent laboratory evaluation in line with regulations set by CPSC and Health Canada. Why are the eyes popping out? "We have observed that certain production runs of this bear utilized substandard fabric which may tear around the bear's eyes," Saunders says. "This may cause the stuffed animals eyes to loosen and fall out, which could pose a potential choking hazard." Earlier this month, the St. Louis-based firm agreed to pay a $600,000 fine to settle allegations by the CPSC that the company didn't immediately report problems with a folding beach chair. The CPSC alleged that sharp edges on the chairs could cause injuries when they were folded. The chairs were sold through the company's website from early 2001 until October 2008. Under the settlement, Build-A-Bear denied the allegations concerning a "defect or hazard" involving the chairs and that the company broke the law. The company recalled 260,000 beach chairs in May 2009. As for the Colorful Hearts bears, parents should take them from their kids and return them to any Build-A-Bear store for a coupon good for any available stuffed animal, the company says. Consumers can also call 866-236-5683 for more information.